Order within 13 hours 43 minutes for Same Day Delivery! 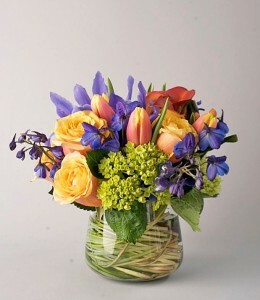 Charming and colorful, this textural arrangement is compact and an excellent choice for a smaller space! It is shown at $69, which works very well on a desk. We also make a $89 version in a larger vase with more flowers! The $59 version is in a smaller vase and more modestly filled. 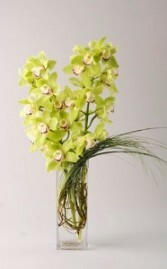 Why not be indulgent and select the $89 version that is in a yet larger vase and rather opulent! 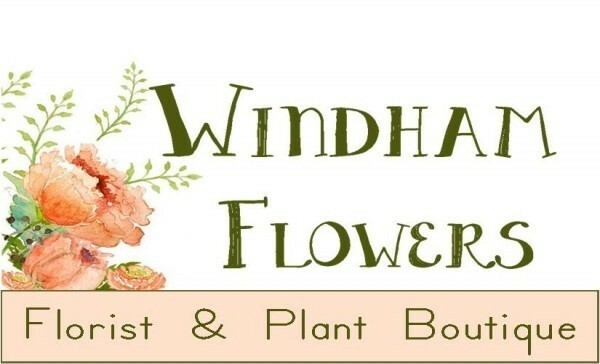 As the seasons change so will the specific flowers we use based on what is available. We will always maintain the color, look, and feel of the arrangement! 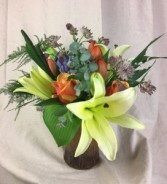 This captivating arrangement features lilies, garden flowers, roses and/or spray roses with a lovely array of our signature textural greens to accent. The second best part is the vase! We make these in our Brattleboro pottery studio. This is one that will be kept for future use! It is hard to capture the beauty of both the vase and the flowers in just one photo! The $75 version features a 6" tall handmade gathering vase, and the $99 version has an 8" tall vase with more flowers! Stunning. Neatly arranged we feature tulips and hyacinthsand possibly ranunculus if we have it! 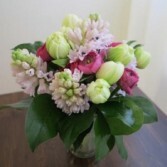 This fragrant arrangement is simple and elegant!